The U.S. Marine Corps Officer Candidate School (OCS) is located at Marine Corps Base Quantico in Virginia. The 10-week program identifies and prepares potential commissioned officers of the Marines to assume the responsibilities of an officer. Candidates are evaluated on three qualities: leadership skills (50 percent), academics (25 percent), and physical fitness (25 percent). The leadership evaluations are based on command presence, communication skills, decision making, and the ability to lead subordinates. Academic grades are evaluated through written exams and practical application (see next section), and physical fitness at OCS is designed to test strength and endurance under varying conditions. 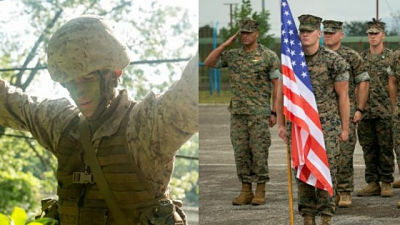 All courses are developed with the six functional areas of Marine Corps Leadership Development in mind: fidelity, fighter, fitness, family, finances, and future – the six F’s. Upon completion of Marine Corps OCS, graduates are commissioned at pay grade O-1 (Second Lieutenant). Upon earning a commission as an officer through OCS, all new officers then attend The Basic School for additional training. Unlike other military OCS programs, applicants interested in becoming an officer through the Marine Corps OCS program must be either a full-time student currently pursuing a four-year college degree or a civilian with a bachelor’s degree. Additionally, applicants must be a U.S. citizen, between 18-28 years old, and able to pass a physical exam. All applicants must first speak with an Officer Selection Officer (OSO) who will help advise of next steps. Contact an OSO in your area. Visit the official Marine Corps website for more information on Marine Corps Officer Candidate School.